Today's prompt is to write about this picture. I apologize in advance for any typos--there is a storm rolling in and I am typing very fast! Whenever I see fog rolling in around me, it always makes me hesitate. I don't think that the moisture droplets in the fog are actually alien nanobots here to alter my DNA. That would be odd. Come to think of it, that would be a good plot for a science fiction movie, sort of a Pod People/Stepford Wives thing. But my thoughts don't usually move toward science fiction when I see fog. There is something about the tide of murkiness surrounding me that implies mystery. On some days, this makes me nervous. I sometimes feel as though the person I am before the fog rolls over me will not be the person I am when the fog dissipates. Maybe this is what it would feel like to have Alzheimer's, I think. Only the fog would be inside of my head. Will pieces of me swirl away in the blankness? On other days, when I am feeling more adventurous, the grounded wall of clouds rolling beckons to me. Come, it calls. See what is waiting on the other side. I occasionally consider following that invitation. I've had dreams of ending up in a different time, or a different part of the world. That would be very exciting, unless the different time involved dinosaurs. I'm pretty sure that I would not like hanging out with dinosaurs. So I hesitate when the fog rolls in, and I think about what that whiteness holds for me. Maybe one day I will walk into the fog. Maybe one day the cares and the worries that tie me here will fall away, until I walk out of the fog into the sunshine of a blue sky, my bare feet stepping on soft green grass. "And all will be well and all will be well, and all manner of things be well" Don't know who wrote that quote, but it fits. I agree about the mystery (too many films set in Victorian London?!) I don't like fog and I agree about the dinosaurs! Love that last positive paragraph. Good upbeat ending. I am ambivalent about the fog as well. It can be scary and it can be awe inspiring too! The fog is a little like having your first child and you have no idea what you are doing... sometimes then, dinosaurs don't look so bad! Maybe this is what it would feel like to have Alzheimer's, I think. Only the fog would be inside of my head. Will pieces of me swirl away in the blankness? I enjoy that you have both perspectives about the fog - fear and interest. So many things in life are like that. The comparison to Alzheimer's was poetic. I worry about developing it and wonder what it is like to lose parts of yourself. 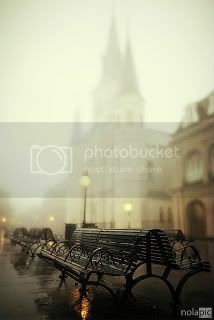 I am not fond of fog, although sometimes it can be romantic if used and portrayed properly...I normally feel damp and alone when faced with fog. I love the mystery of the fog...I'm a pretty gothic kind of gal, so I guess that's where it comes from. I love how the fog represents possibilities to you, that's such an interesting take on it. Great post! I love your take on teh fog. Mine always goes morbid, LOL.